• Multifunctional Sports Hall “Arena Armeec” is the second largest construction project, implemented in Bulgaria after the National Palace of Culture (NDK). It was completed by Glavbolgarstroy for a record short time of 18 months. • The building is designed in two parts. Reinforced concrete monolithic construction and steel roof, which builds on it. • The steel structure is the largest ever produced in Bulgaria. With slotted holes of 120 meters in the internal and 78 in the outer side and lateral width of 98 meters, it covers some 11,800 square meters. This impressively sized structure, intertwined in a complex geometry, weighs about 1750 tons. • Under the contract, the hall is designed for 8 different sports, but now the number of sports you can practice in it exceeds 30.
o The floors of the multifunction facility are changed every 24 hours, which allows for a very compressed schedule of sports and cultural events. o The new Bulgarian Sports Hall “Arena Armeec” Sofia is equipped with the latest multimedia features. o In addition to universal electron dashboards to show actual scores, the hall is equipped with a high-resolution video cube. o Booths to control multimedia and sound provide the perfect visual contact with the sports arena for quick and adequate intervention. o The hall’s lighting offers different modes, depending on the sport being practiced at the moment. o The completed training hall is a prerequisite for the organisation of top-class international events. Athletes have direct access to its main arena built by the walkway. o The capacity of the existing hall is 12,529 seats, including 3500 on telescopic platforms, and they can be deployed or stowed away in boxes. Concerts may gather audiences of between 17,000 and 19,000 people, depending on how the scene’s orientation. 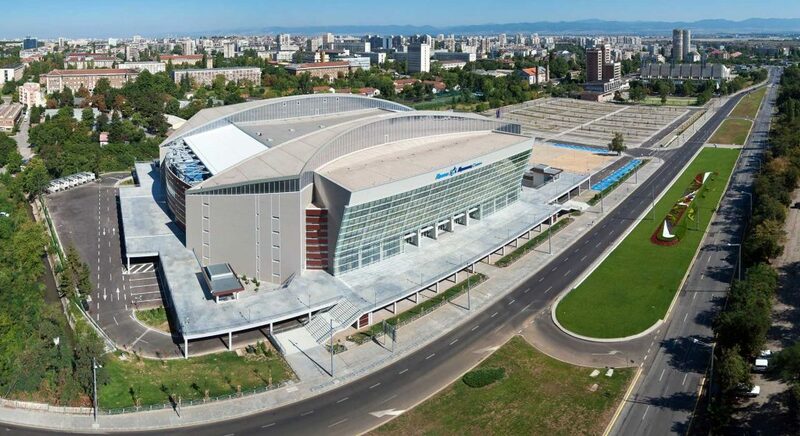 o “Arena Armeec” has 75 exits from the main arena, enabling the evacuation of 19,000 people only within 3 minutes. o Air conditioning in the room is completed under a new state-of-the-art concept, similarly incorporated in the construction of the new sports complex in Rome. We have used the same cooling equipment in the hall and the lobbies. The system automatically switches the capacity to provide the most favourable environment on the arena and in all rooms.